Millions of people in the world search for answers to the questions: how to learn a foreign language, how to overcome the language barrier. We recommend you to use Pop-Up Dictionary, which has been granted a lot of awards. Support of unlimited number of languages. A flexible system of learning words supported by your individual settings. An opportunity to edit existing dictionaries or create your own ones. A unique system of hyperlinks you can use to make audio/video links to every word. A balanced combination of the dictionary options and the methods of the built-in training system. Translation of the words you select in texts and the option to include them in the learn-your-words list. A combination of several ways to train your memory: motor, auditory and visual. A convenient control panel to set fonts, colors, window sizes, etc. of your own choice. Multilingual Dhammapada in 17 translations is added. 1,000,000 entries English-Russian dictionary is added! Pali-English dictionary is updated, Sinhala script is added. 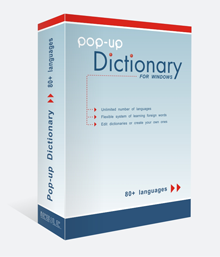 Pop-Up Dictionary 4.8 is released.